Our professional operations staff deliver A-Z hands-on training on all aspects of successfully owning and operating a Maid-Rite Diner. Our training team can easily teach an individual without any restaurant experience how to successfully run a Maid-Rite Diner. Our staff is also skilled at training a seasoned restaurateur in our proprietary operation. The beauty of Maid-Rite is that we have an all natural house-made menu that is delicious, satisfying and affordable, while also being easy to execute by owner-operators and their staff. Once your build-out is complete, a team of two Maid-Rite trainers will travel to your new Maid-Rite Diner to train you, as the owner, and your manager for approximately five days on all aspects of running a successful Maid-Rite Diner. Our team will then train your staff for approximately five more days before the soft opening where we will assist your restaurant team to serve the public our famous Maid-Rite menu the "Rite" way! 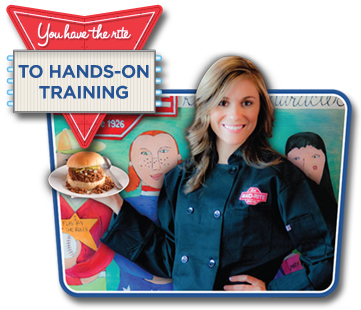 Our hands-on training and attention to detail is the key to our franchisees' success with our Maid-Rite University personalized training program. You will gain invaluable hands-on experience in your new Maid-Rite Diner as our trainers teach you every nuance from the front to the back-of-the-house with our hands-on easily executed restaurant system. You will be proficient in serving your customers delicious, world class food in an immaculately clean Maid-Rite Diner before our team certifies you as an independently owned Maid-Rite franchisee and departs your restaurant. Our trainer will then be on call 24-7, 364 days a year to answer any questions you may have. As a Maid-Rite franchise family member, on any given holiday, if you need anything, you may contact our President & CEO. He is always available. Our graduates who have completed Maid-Rite University are now successfully owning and operating their Maid-Rite franchise restaurants and, in the true spirit of service quality, are known as "Ambassadors of Hospitality." Our franchisees deliver exceptional service day in and day out for each and every customer. Let us help you and your employees become successful with our ongoing support of your new Maid-Rite franchise restaurant that starts with Maid-Rite University!